Two July's ago, I held my phone up to the American flag hanging limp and heat-shocked from the gingerbread eaves of my cute little house on what some might call the wrong side of the tracks. I captured the sun filtering warm through the nylon fabric and my heart swelled in stripes. Inside, my little family gathered around the kitchen table with one new friend, fresh out of prison, already tearing the wrapper off the new start he was promised. He spoke kindly to my children, took seconds of my strawberry muffins, and when it was time to drive him back to the homeless shelter, I packed the rest up and sent them with him. He had stars in his eyes, that July, but he was no body's fool. A convicted felon, he faced insurmountable odds, beginning with bleak housing options and ending with the reluctance he met on a loop when searching for a job. His entire family lived hundreds of miles away, and when he left our home that day, he looked Cory and I both in the eye and said we were his best friends. It was the first time I'd ever met him. Last week, on Christmas Day, he was here again. We ate tacos and black beans, then two more showed up unexpectedly, and another. This is not what Christmas is supposed to look like banged the reverb of my heart, over scattered conversation, our unfestive meal, the show-boating and attention grabbing and him, quiet, mostly alone again in the world, back at the same homeless shelter, back at our table with his good intentions and his relentless pursuit of hope. I wondered if he could feel our love amid all the commotion. My family drove that night to Ohio. I finally found the capacity to pick up The New Jim Crow (Michelle Alexander,) staying up past midnight, nodding along, thinking of my holiday friend, and all the friends like him. I drank the words, my pulse quickening. I am the mother of four non-white children. I've seen racism play out against them all in ways both subtle and otherwise. I over-think it like it's my job, because it is. I worry for all of them. But I only lose sleep over the safety of Robert, who two months ago drove for a day with a burned-out tail-light and was pulled over four times in under thirty-six hours. The last time ended with him sitting on the curb while his car was searched in vain for drugs. It doesn't matter that he's never had a drug charge. What matters is that he's black, he's young. He has "that look". I read about racial bias, swallowing the lump of my own culpability while my eyes burned and the pages turned. I cannot escape the ways I've been complicit, the ways I've bought what's sold and carried what's passed my way. Sitting on my parents' couch, the book still in my lap, I heard the news about Tamir Rice, and the shocking failure of the Grand Jury to indict the officer who shot and killed the twelve-year old boy. 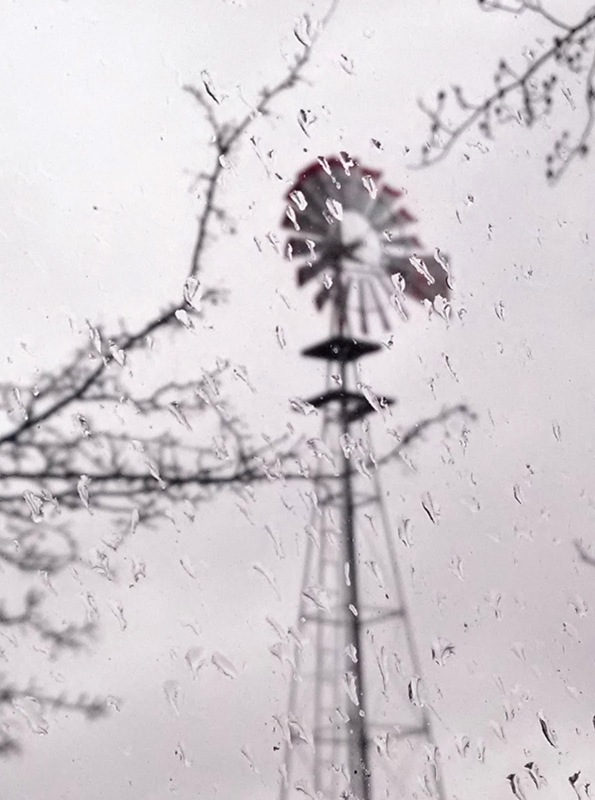 Rain beat against the window while the windmill cranked into overdrive. It was the perfect storm of despair and desire, that moment when something crystallizes and you suddenly know a thing you had not known before. I am a white, middle-class woman who might have more proximity to the burn of poverty and racism than many like me, but I haven't gotten mad enough. I haven't stared hard enough at my contribution to this pain. I mean, I've cared. Just not quite as much as I've cared about my life goals of balance, pleasure, style, or success. I'm left wondering as 2016 closes in, what do my priorities say about the true condition of my heart toward my suffering brother? I'd like to spend more time reading and moving in the new year. It would be nice to streamline my wardrobe and maybe eat less Taco Bell. Of course I want to be ever-more present and available to my family. But I am simply and profoundly missing out if all my goals begin and end with me, or if they fail to fall heavy against the throb of injustice. If we can't aspire to shift our hearts toward right things, it doesn't matter if we stay chubby, weak, worn-out and in debt. If we can't take seriously our task to do justice and love mercy, who cares if our cabinets are crammed with empty carbs or our closets are a mess? Sure, we can commit to studying our Bibles more, but it will continue to be meaningless if we persist in fitting truth around our paradigm built on cash, security, and a pack-mentality where homogeneity just feels best. I'm tired of being fed the lie that I should crave a simpler, easier lifestyle. I don't want to aspire to greater love if that love does not, in practice, cost me something. When my life is over, I can only pray that I'm good and tired, worn thin from running my race, carried to its end only by Jesus, who promises living water along with the ache of surrender. The good news is that Jesus waits for us somewhere in the trenches, in the skin and hair and unfamiliar scent of wanting. He's there, in the shared meal of an outsider, in the loneliness of the overlooked, in the cheated, the oppressed, the "This time will be different". He loves us enough to not let us use up our chances to walk with him toward an end to the crippling disease of Us and Them. He's already there in the thick of it, and should we decide poverty or racism or mass incarceration or abuse or addiction or homelessness are not among our top ten problems, we owe it to ourselves to at least acknowledge that we're trading our perceived safety and comfort for an encounter with the Holy God who continues to hold us close despite (because of?) our own versions of track marks, busted teeth, welfare checks, and handcuffs. This afternoon, Cory called from the jail, just ten seconds on one of his busiest days of the year. "He's back in booking", our friend who six days ago swore he'd never go back. His offense? Missing a parole meeting because he was unexpectedly working late at a last-minute job offered through the homeless shelter, with no vehicle and zero options. We can pick it all apart. We can say he should've known better. But honestly, it's way too late in 2015 for that sort of judgment. Next year, I just want to do better. This, this, this!!!! I've read it twice and I'm going to read it again. "When my life is over, I can only pray that I'm good and tired, worn thin from running my race, carried to its end only by Jesus, who promises living water along with the ache of surrender." I read that line many times as well. Wow. I hope I can say the same! "he was working late at a last-minute job offered through the homeless shelter, with no vehicle and zero options." I just want to cry for him! I keep cycling through my "southern white comforts" and trying to figure out my place in this "drama". I KNOW my calling is to follow Jesus. I try to move forward in that every day claiming Eph 2:10 that HE has prepared things for me to do in advance. The problem is that it is easy to sit in my nice house every day and not go out looking! The tension is real and heavy! This is sinking deep. "I don't want to aspire to greater love if that love does not, in practice, cost me something." Amen. We need to hear this - often. These examples of everyday injustice aren't unique, but these stories are so often missed in this noisy world. Thank you for stating this message so simply and honestly, right at the time we're reflecting and considering the new year. May we focus on what truly matters. I started reading your blog years ago for decorating and news about the kids and the farm and stayed for your move to the city and for inspiration. I am not really religious although I believe in God. I have felt my faith slipping since the Zimmerman trail and the lack of action in the Tamir Rice case has saddened me. As the mom of 3 with the last 2 coming to us from China and Korea I have heard comments about their race which isn't as blatant as what your oldest goes through but is still disheartening. I hope this coming year puts Robert in a better place. I need to read this about a hundred more times. Thank you for being so open, true and raw. You are doing something very right. Thank you for shining the light on problems we have never had to face. "Who is my neighbor?" I think God answered that for us. Standing on the promises, is easy to sing. But what about "If you love me obey my commands?" I hope I never stop learning and looking for Him in the hard places. He never said we would find Him in the comfort and ease of the "prosperous" life. I have been so wrong, for so long. Crying. Praying. Crying some more. This is exactly where I find myself at the end of 2015; stumbling and rumbling and trying to figure out what "my part" might be in a more just, more merciful tomorrow. thanks for these words, friend. I think we need to be so careful in judging others. My son a social worker in the criminal justice system told me about a man who was a proponent of more police training so that police would be less likely to make the wrong decision when firing the gun. The man was put through training on when to draw and fire his gun and then placed on a range to practice. Within 3 seconds he pulled his gun and fired at a an innocent target. We need to be careful of judging others too harshly. Yes the system is flawed but so are we as people. All of us. And my family is multi racial also. What have I taught. Cooperate. Cooperate. Cooperate. And one of our adopted children who is white was in justice system on his own. It was no walk in the park for him. Let us not jump on band wagons. Let's act in love and not look at how good we are and how bad they are. That will resolve nothing. Let us pray and act in our own spheres but no promote hostility. Anger yes. Hostility no. One of your best posts. Yes yes yes. Profound. Powerful. Necessary. Thank you. So convicting. Love your heart! Now what to do with all that I'm feeling...praying He makes it clear. Thank you for sharing these words. Oh, Shannan... My heart aches for Robert—and his parents—and for all of the many "faceless" people suffering injustice at the hands of our world, communities... me. Keep raising awareness and holding us all accountable, sweet friend. There cannot be "us" and "them" if we are loving our neighbors well. Getting involved, as you know, is ugly, dirty, and inconvenient. To look the other way is a sin. geeeesh woman. you're so right. "I'm tired of being fed the lie that I should crave a simpler, easier lifestyle. When my life is over, I can only pray that I'm good and tired, worn thin from running my race, carried to its end only by Jesus, who promises living water along with the ache of surrender." Thank you for writing these words that I need (but not necessarily want) to read.